One day I decided to go to my local library to see if they had any good books. It's pretty small and has the lowest funding in probably the entire state so my library tends to not have very many new books if any. That day The Outsiders was sitting on the shelf all alone and I snatched it up immediately. In middle school one of my literature teachers recommended that my class read The Outsiders over summer break stating it as her favorite book of all time. Other teachers I'd had didn't much care for the book and wouldn't let us read it as part of the curriculum, some stating that it was inappropriate for us to read. That day at the library when I brought the book up to the front counter the librarian saw the cover and smiled at me, "Now that's a real good book," she said. Now that I've read it, I say that she was absolutely right. The Outsiders was about gangs, two different social classes clashing, feeling lost as a teenager, friends, loyalty, love, hardship, and being an outsider. S. E. Hinton did such a phenomenal job setting the perspective of the 'greaser' boys' perspective, you'd have to think that she had to have been writing about her own life. I'm still in shock at the fact that she wrote this at the ripe age of 16 creating an instant American classic. She captured emotion so vividly, and portrayed the struggles of kids growing up on the streets and getting caught up in gangs to feel a sense of belonging and family. The love between the three brothers in this book was beautiful, they fought a lot and struggled to remain strong in the wake of their parents' deaths but try hard to stick together. I feel like I can't do this book justice with any fancy words I could think of to describe just how much I like this book. Truly, I wish that I had read this book back in middle school though looking back I may not have understood the book's significance quite as well back then as I do today. It is no wonder how this book became an instant classic, it touched my heart and had me mourning with the losses that Ponyboy had to go through. Sodapop, Darry, and Johnny were my favorite characters of the lot, but even then I still love the rest of the gang including hot-headed angry Dally. Apparently this book was also made into a movie which I'm super stoked about and want to watch ASAP, and not just because Tom Cruise and Emilio Esteves are in it. 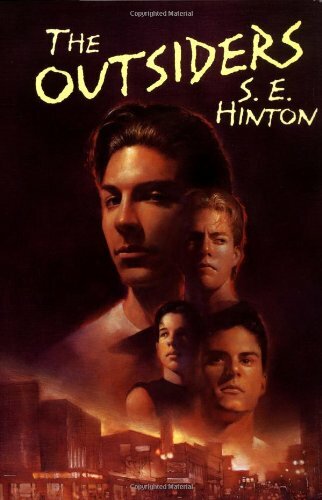 If you haven't read The Outsiders, trust me you've been missing out on a really good book. Five stars, hands down.